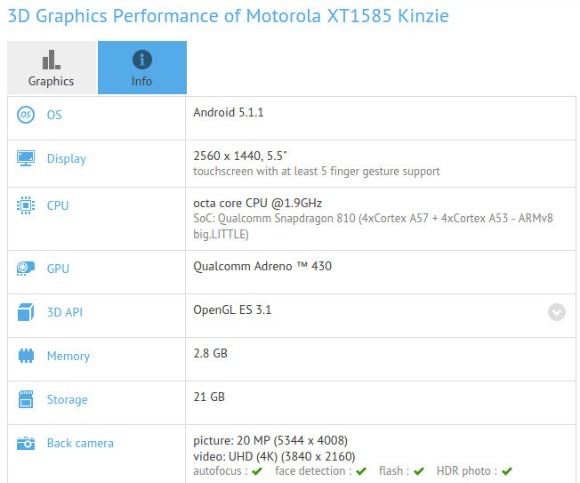 The Motorola device with the model number XT1585, which is apparently codenamed Kinzie, has been leaked about a month ago when it was said to be on its way to Verizon. Hence, it's definitely going to use Droid branding. Some of its specs were outed back then, but now we have a complete picture thanks to yet another benchmark listing. This tells us that the phone will feature a 5.5-inch QHD (2,560x1,440) touchscreen, a 20 MP rear camera with 4K video capture, a 5 MP front-facing unit, 3GB of RAM, and 32GB of storage. It will be powered by Qualcomm's Snapdragon 810 chipset, which comes with an octa-core CPU in the big.LITTLE configuration - with four high-performance Cortex-A57 cores, and four battery-friendly Cortex-A53 ones. Most of these things were mentioned before, but the screen size is different than the 4.6" previously rumored. The prototype which was tested ran Android 5.1.1 Lollipop. The phone also has support for NFC, Wi-Fi, Bluetooth, and GPS. If history repeats itself, expect to see this in stores around October. Based on its specs, it should be the successor to the Droid Turbo from 2014.